The most popular and most trusted name in roll bending brings you the CP40H Three Driven Roll, Universal Bending Machine with Hydraulic Bending Roll, 40-Position Auto-Repeat Control. All 40�s have LED�s for precision bend control. Our units roll standard/special sections and tube/pipe in a variety of material types. The CP40H is rated for 2" x 2" x 1/4" angle and 2" schedule 40 pipes! Our Heavy Duty, Versatile unit is Top of the Line, Superior in Every Aspect. Maximize Your Investment! Our Efficient CP40H Pyramid Design uses a wide lower inter-axis and extended forming roll vertical travel to maximize power on large sections and obtain tight ID�s on small profiles using supplied Universal Roll Set. Compare 30% Higher Weight, 30% Higher Horsepower, 100% more reliable frame, 100% Superior Warranty than many �Look Alike� brands. Don�t be fooled by cheap imitations! 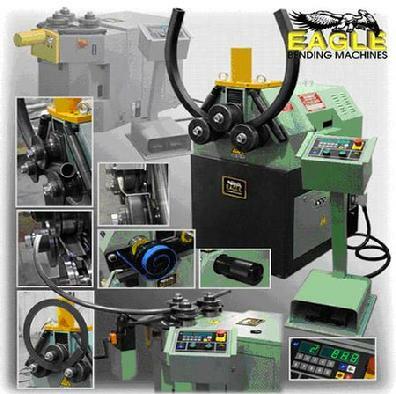 Eagle Bending Machines IS ROLL BENDING! � UNCONDITIONAL LIFETIME MAIN FRAME WARRANTY Against Stress Cracking!! � Mobile Controls with 40 Position Auto-Repeat; Large LED Display; Heavy Duty Steel Foot Pedals; Palm E-Stop. Additional Palm E-Stop located on the side of the machine. � Flush Electrical Cabinet with running/diagnostic lamps, SIEMENS Switch Gear, 24VAC controls, Thermal Overload w/ Reset Protects Motors, safety micro-switches on cover.